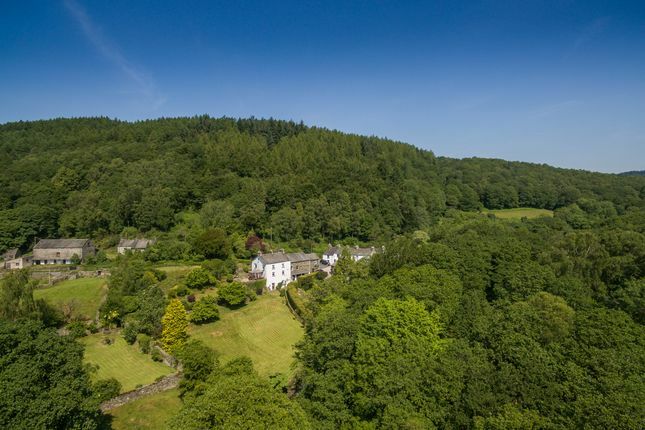 Force Forge House represents an ideal opportunity to acquire a truly substantial traditional detached Lakeland property which we believe was built around 200 years ago. A highly versatile and generously proportioned property which is spread over three floors. The property provides four excellent bedrooms, with three large reception rooms together with extensive garaging and storage plus useful one bedroom annex all set within approximately 1.1 acres of delightful grounds with river frontage. The current vendors have lived in the property for over forty years enjoying the excellent living accommodation which is light and airy and although it may require some modernization, it does benefit from attractive country views nestled in a tranquil position with impressive south facing views. The annex could be utilised to generate an income whether as a holiday letting unit or on a short term basis. The house is squally suitable as a main residence or second home/holiday property. Set in an idyllic picturesque location between Coniston Water and Windermere on the borders of Grizedale Forest not far from Hawkshead. The area is popular with visitors, offering many leisure activities including hill, country, riverside and forest walks, sculpture trials, on/off road cycle routes, boating and GoApe on the doorstep. Only five minutes south of Satterthwaite there is a popular Public House. Directions The village can be approached from the south from Rusland Valley or from the north through Ambleside and Hawkshead, passing through Grizedale Forest Park. If approaching from the north continue through the village of Satterthwaite, for approximately 1.5 miles and the house can be found on the left hand side nearly 0.5 miles south of the bridge. 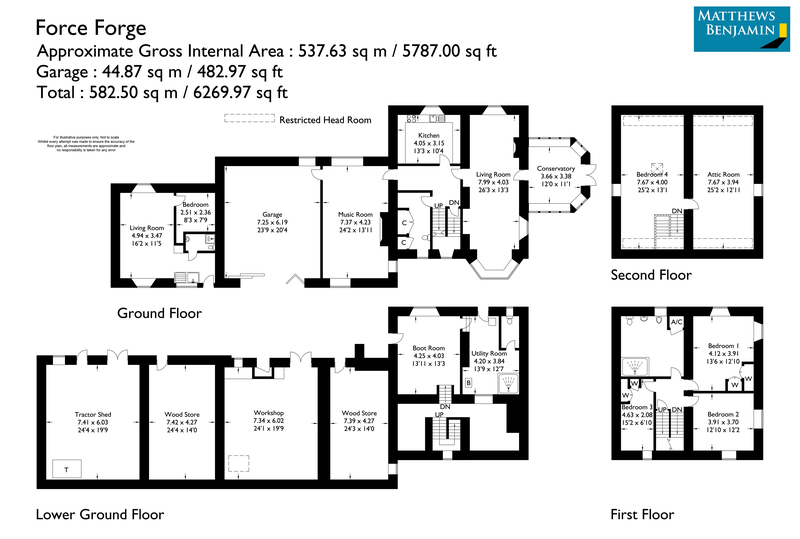 Living Room 26'3 x 13'3 (7.99m x 4.03m) Substantial triple aspect room with impressive feature bay window. Inset cast iron Calor gas fire with marble hearth and surround. TV and telephone point. Attractive country and garden views. Hallway Internal hallway with night storage heater. Access to the cloakroom with a selection of fitted cupboards with separate WC and wash hand basin. Enclosed access to lower ground floor. Kitchen 13'3 x 10'4 (4.05m x 3.15m) A selection of wall and base units with 1.5 stainless steel sink unit and mixer tap. Appliances include four ring electric hob and double electric oven. Plumbing for dishwasher. Part wall tiled. Views across the garden. Music Room 24'2 x 13'11 (7.37m x 4.23m) Generously proportioned triple aspect room with multifuel stove set on a feature slate hearth and surround. Slate shelving. TV point and country views. Access to garage. First Floor Landing Enclosed staircase leading to second floor. Rear Bedroom One 13'6 x 12'10 (4.12m x 3.91m) Spacious double dual aspect room with two window seats and two double built in wardrobes. Delightful south facing sunny aspect towards the garden, river and countryside. Front Bedroom Two 12'10 x 12'2 (3.91m x 3.70m) Double dual aspect room with garden and country views. Bedroom Three 15'2 x 6'10 (4.63m x 2.08m) Spacious single room. Bathroom A generously proportioned room which was originally a bedroom. And now comprises of a four piece suite including a double shower cubicle, pedestal wash hand basin, bidet and WC. Electric shaver point. Airing cupboard concealing cylinder. Garden views. Attic 25'2 x 12'11 (7.67m x 3.94m) Superb storage facility with vaulted ceiling and exposed beams. Laundry Room With Belfast sink and plumbing for washing machine. Thermeco oil fired boiler. Corner shower cubicle and concealed WC. Rear door. Kitchen With a basic selection of wall and base units. Sink unit and electric cooker point. Plumbing for washing machine. Night storage heater. Living/Dining Room 16'2 x 11'5 (4.94m x 3.47m) A open plan dual aspect room with country views. Night storage heater. Bathroom 8'3 x 7'9 (2.51m x 2.36m) Double room with recessed wardrobe area. Shower Room Assessed from the kitchen. A three piece suite comprising of shower cubicle, wash hand basin and WC. Electric shaver point and extractor. Outside An excellent double garage which forms part of the original barn and can be accessed directly from the road. With sliding doors, power and water, providing parking for at least two vehicles. With upper storage area. To the rear of the property there is a right of way across the adjoining courtyard leading to two highly useful storage rooms under the annex. A gated drive with a public right of way for approximately 20 yards to the public footpath. Also allowing access to the highly useful wood shed with power and workshop with double doors housing oil tank with power. Additional gate leading to a magnificent and substantial lawn bordering the river. The garden has a manageable selection of shrubbs and bushes, from the main lawn there is access into the impressive and private former kitchen garden currently a secondary lawn which is bounded by a natural stone wall with a old well. Front the main lawn there is a path leading up to the front door and a terrace providing a lovely vantage point. There is a natural elevated selection of garden. Whilst across the road in another section of natural land which it also owns. Services Mains water. Private drainage. Oil fired central heating. Night storage heater. Tenure Freehold. Vacant possession on completion.